Millenium Izziv challenge: Ana Dolinar Horvat joins the training of professional athletes • BTC d.d. The diversity of trainings which allow the participants to overcome their own limits is the particularity of the Millenium Izziv challenge, where motivation is key. The latter is found in visible results, encouraging words of trainers and last but not least in training in good company. 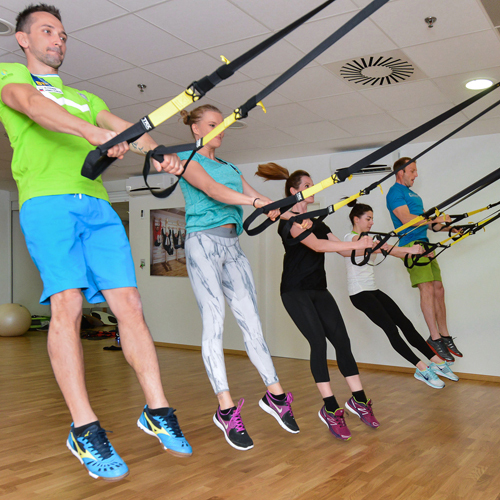 Ana Dolinar Horvat was treated to all the above mentioned, as she was joined in her trainings by famous Slovenian athletes supported by the BTC Company: gymnasts Adela Šajn, Tetyana Zahorodnya, and Sašo Bertoncelj, and kayaker Nejc Žnidarčič. “The necessary introduction to each training is warming up”, pointed out Vid Koblar who put together the training programme. Participants started their training with a series of warm up exercises which reduced the possibility of injuries. This was followed by exercises for the improvement of stability, balance, and for the strengthening of the musculature of the entire body, and concluded with the final stretching exercises. The Millenium Izziv challenge is an integrated sports programme sponsored by the BTC Company, which supports numerous Slovenian athletes and sports organisations, and strengthens the Slovenian Olympic movement in BTC City Ljubljana. This year’s Millenium Izziv challenge is second in a row and it includes, along with Ana Dolinar Horvat, also three other challengers – Barbara Zalar, Matic Marolt, and Primož Erjavec. Under the expert supervision they are all encouraged to take on a more active lifestyle long-term. The 3-month programme which started in March will upon its conclusion in June with final measurements show how much lighter and slimmer will the participants start the summer. Follow the development of the Millenium Izziv challenge at btc-city.com/IZZIV or via Facebook #MilleniumIzziv.